Welcome to the Hakko Densho Ryu Martial Arts Federation (HMAF) website! The purpose the Hakko Densho Ryu Martial Arts Federation (originally the Hakkoryu Martial Arts Federation) is to further the study of Hakko Densho Ryu Jujutsu and spread the teachings of this art throughout the world. 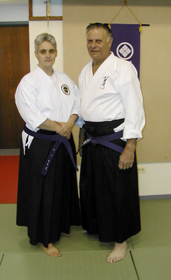 Dennis G. Palumbo Shihan, founder of both the Hakkoryu Martial Arts Federation and the Hakko Densho Ryu Martial Arts Federation, committed more than 40 years of his life to teaching Hakkoryu Jujutsu, traveling around the country offering seminars, holding annual Gasshuku (large gathering for the purpose of training), and providing a path for rank in Hakkoryu Jujutsu and Hakko Densho Ryu Jujutsu to all qualified individuals. Palumbo Shihan respectfully retired from the Hakkoryu Hombu Dojo in 1998. In an effort to continue passing the teachings of Shodai Soke Okuyama Ryohu and abide by the current wishes of the Hombu Dojo, he created the system Hakko Densho Ryu - meaning Hakkoryu taught as Palumbo Shihan was taught, the technique passed down in the traditional manner, by word of mouth. Dara Masi, Menkyo Kaiden Shihan San Dai Kichu, the Head of Hakko Densho Ryu Jujutsu and Director of HMAF, follows in Palumbo Shihan's footsteps, traveling around the country teaching seminars and transmitting the knowledge to all who want to learn. We invite you, whether you have dedicated your training to Hakko Densho Ryu Jujutsu or simply have an interest in experiencing this unique martial art, to join HMAF or to attend an HMAF sponsored seminar.